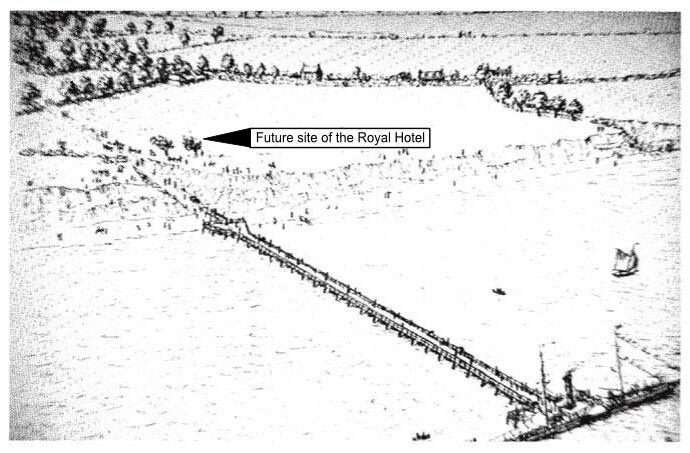 The development of the West Beach in Clacton-on-Sea. The history of Clacton that is of any relevance today really only spreads over the last two centuries. Until the late 18th century there was virtually nothing here beside the towers, built in Napoleonic times to guard the southeast coast against invasion. The name was derived from a circular tower at Mortella Point in Corsica which, on bombardment by the British Fleet in 1794, proved to be very difficult to subdue. The construction of these towers was solid - extremely solid, rising to approximately 40 feet high with heavy guns mounted on top. With the threat from Napoleon gone in the year 1815, they became redundant so many were pulled down, however the two either side of the cafe still remain. Tower E situated on the west side of the cafe. The modern Coastguard Station built nearby can be seen on the left hand side. The F Tower standing to the east side of the cafe with the disused coastguard lookout positioned where the cannon would have been sited to repel an invasion from the french fleet. This Tower must have been very impressive when first built as only a few towers were chosen to have a moat and drawbridge. Providing excellent sea views, it subsequently became a lookout for the coastguards with cottages being built in Tower Road to house their families. 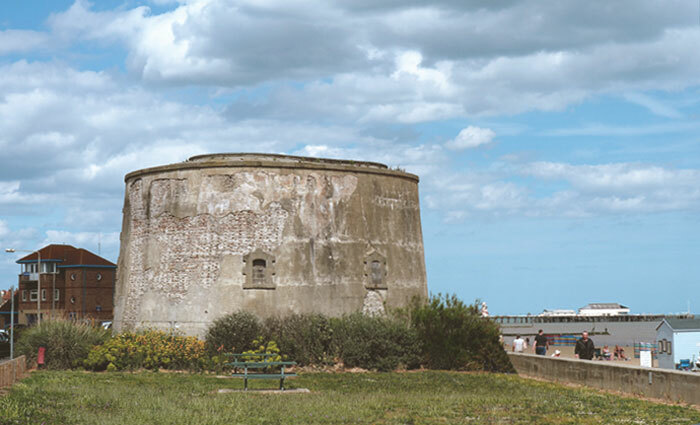 In Edwardian times the tower was a meteorological station for the production of Clacton's weather reports. Earlier this century it was furnished out for use as a restaurant and then housed a children's zoo, but at the moment stands idle awaiting a new venture. The town evolved due to the efforts of Peter Bruff, an engineer, who discussed his idea of building a pier with William Jackson, chairman of the Woolwich Steam Packet Company in 1870. The company, which ran a ferry service of about 70 miles from London to Margate, considered it may be to their advantage to introduce a further stop after the same sailing time on their London to Harwich and Ipswich route; so it was agreed their steamers would call in regularly when the pier was built. This service proved to be popular with the passengers but they needed somewhere to stay so in 1872 the Royal Hotel was built where the two large trees are shown in the drawing on the side of the Gap. This drawing shows the first paddle steamer docking at the new pier on the 18th July 1871. 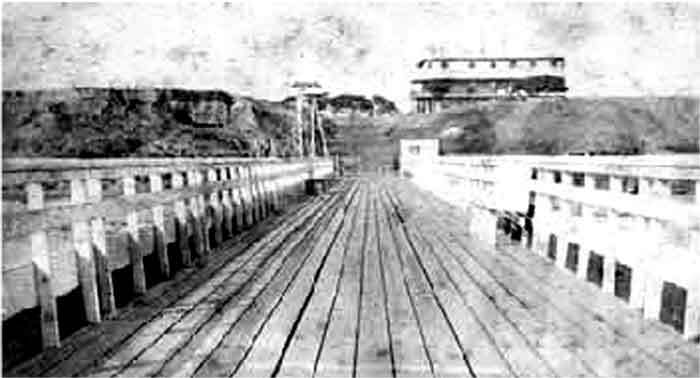 A photograph taken from the end of the pier in 1872 shows the newly built Royal Hotel. This development and a few cottages that had already been built in Rosemary Lane for the families of coastguards and farm hands was to be the beginning. 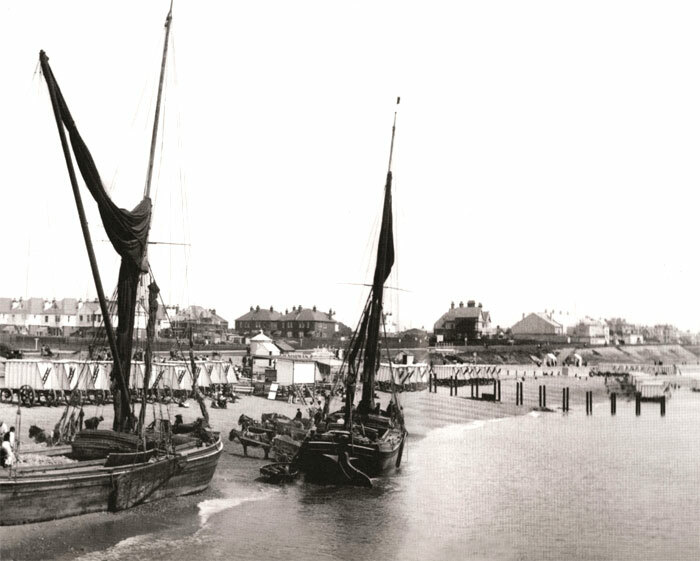 The inland village of Great Clacton was the closest habitation so the new settlement became known as Clacton-on-Sea. The building of assembly rooms, a public hall, a library with reading rooms in 1877 placed the town firmly on the map! With passenger numbers arriving by the steamers increasing and extension of the railway line from Thorpe to Clacton-on-Sea in 1882 bringing more holidaymakers by train the town continued its rapid growth. In 1898 a smaller version of the pier was built, positioned very slightly to the west of the cafe and aptly named "The Jetty". The idea was, with the aid of a steam crane, to handle the unloading of building materials required for the continuing expansion of Clacton-on-Sea. Unfortunately, the venture did not prove to be a great success mainly because the owners of the flat bottomed barges continued to discharge their cargo by beaching adjacent to the Jetty rather than tying up alongside. Maybe the jetty docking fees were too high or old habits die hard, but the reasoning behind this attitude has become blurred over time. Keeping the barges afloat while unloading would appear to have been a much easier option than beaching during rough sea conditions. In this photo taken in 1912 looking east from the Jetty, barges discharge their cargo of building materials into horse drawn carts. 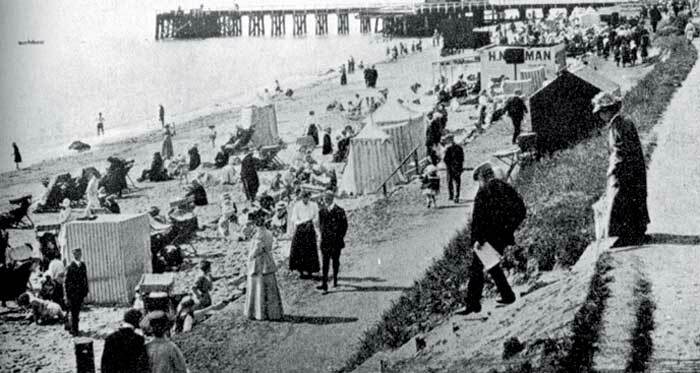 A busy West Beach around 1908 showing the Jetty in the background. No sight of the steam crane at this time. Arriving on a high tide and beaching on the sand as the sea receded worked well in calm weather, but during a heavy swell it became a great deal more hazardous. The high waves would lift up the barge and crash it down on the sand - with a heavy load on board it was in danger of breaking its back. In desperate times the 'plug was pulled', the barge would fill with water and sit down firmly on the beach. No problem if loaded with bricks but not so good with sand or cement! Horses were used, often requiring three horses for one small cart, to pull the cargo over the beach up Wash Lane to where a depot was situated in readiness for distribution around Clacton. 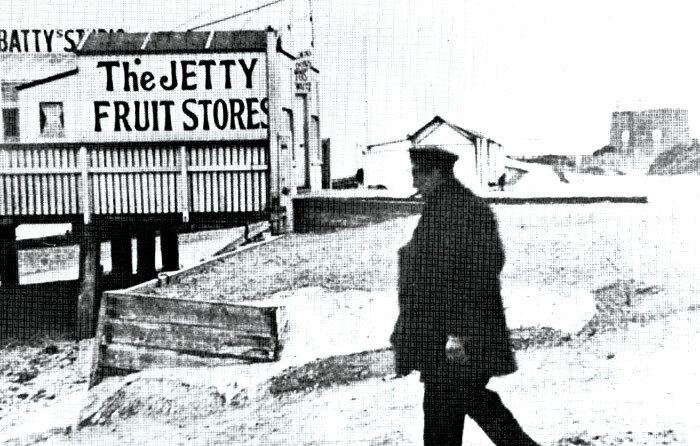 Between the wars the Jetty was adapted for use as a small pleasure pier by offering various entertainments, but its demise came in 1940 when the army dismantled it as a precaution against German invasion. It has never been rebuilt but the remaining piles could be seen on low tide for many years. An unscheduled visit by Winston Churchill on 25th April 1914. During his appointment as First Lord of the Admiralty, Winston Churchill took a flight in seaplane No 79 to inspect a new seaplane base at Felixstowe. Unfortunately, the plane's engine began misfiring as it passed over Clacton forcing the pilot to put down directly outside the cafe and taxi to the shore. The news spread through the town like wildfire and it wasn't long before Churchill was besieged by a group of suffragettes campaigning for the vote for women, photographers, pressmen and sightseers. He soon beat a hasty retreat to the sanctuary of the Royal Hotel while waiting for a replacement. On arrival, the pilot mistakenly searched for the original seaplane on the east side of the main pier - not on the east side of the Jetty! Winston Churchill leaves the Jetty to seek refuge in the Royal Hotel away from the campaigning suffragettes, pressmen and sightseers while awaiting a replacement seaplane. To the cries of 'Votes for Women' Churchill, smoking a cigar, boarded seaplane No 19 at 3.30pm to continue his journey to inspect the base at Felixstowe. Not finding the floating seaplane he decided to return to base after making one last reconnoitre over the West Beach. Fortunately on this occasion he spotted it and a relieved Churchill was soon leaving the Clacton crowds behind, but this tale of woe doesn't end here, as they were passing Walton-on-Sea this plane's engine also died and they made another forced landing in the sea just off Walton Pier! Churchill was not amused to say the least, he ordered a tug from Harwich and the seaplane was towed to Felixstowe. Not a good day! Upon the outbreak of the last world war the personnel in charge of the war strategy considered it to be highly possible that Hitler would begin his invasion of Britain somewhere along the southeast coastline, so strong defensive measures were implemented along the West Beach. 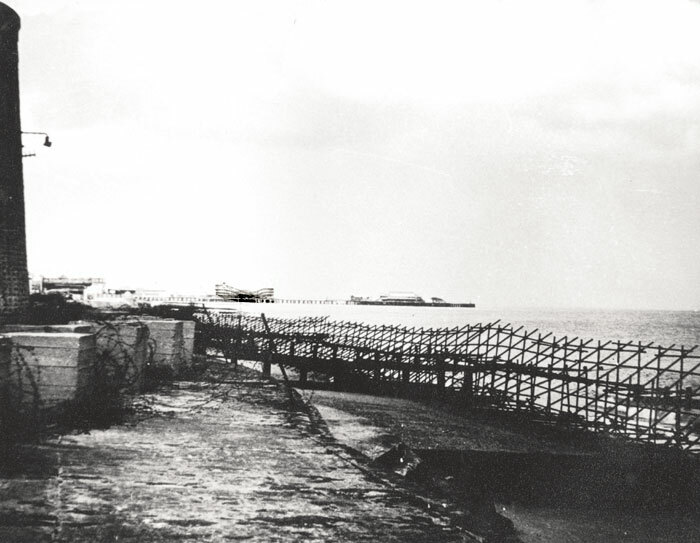 The army removed planking from the pier and made it ready for explosives to be planted if an attack happened thus preventing an easy option for German troops to come ashore, dismantled the Jetty, turned the Greensward into a dummy minefield and erected defences along the shoreline. The newly opened Butlins Holiday Camp was commandeered by the authorities to be used to imprison aliens living in Britain. 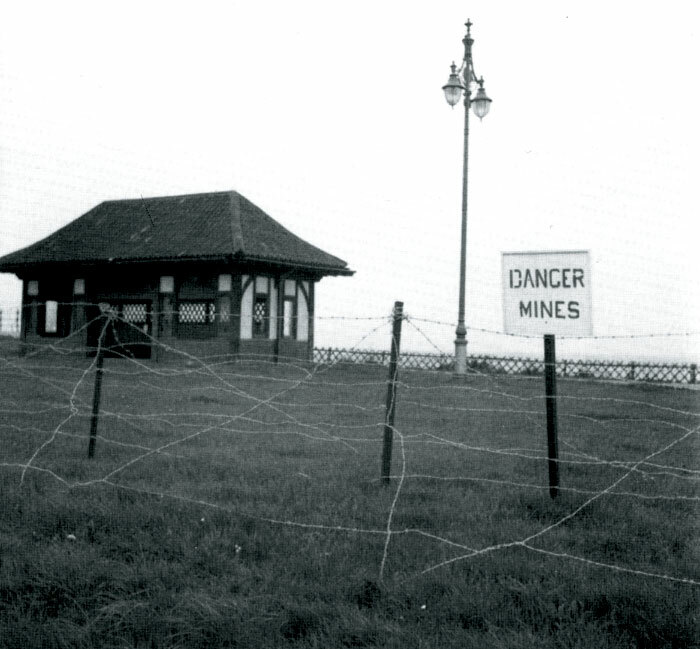 Internment Camp 4 was surrounded with barbed wire and floodlit; understandably this decision caused great concern to local residents who were living under an enforced blackout as they knew the lighting would become a beacon for bombing. However, due to lack of prisoners, the camp was soon closed and taken over by the newly formed Auxiliary Military Pioneer Corps (AMPC). The Greensward was mined! Well not strictly true: it was made into a dummy minefield. Foreground showing the erected barricades on the promenade by Martello Tower E and in complete contrast the background shows the big dipper ride and amusements. However steps had been taken to prevent the pier being used by invading troops. 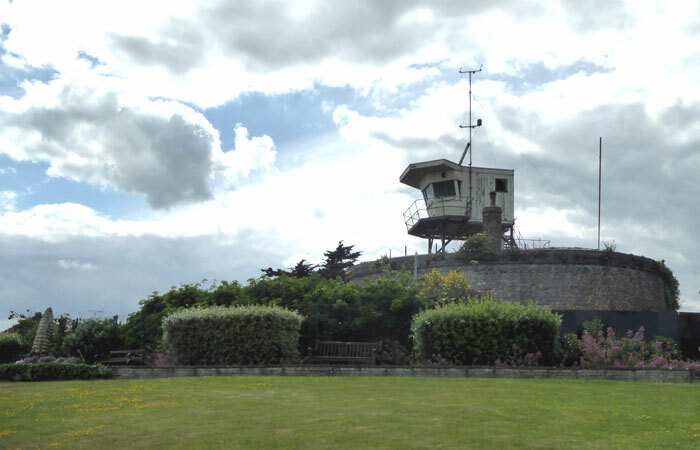 After one death and five injured from enemy bombing in December 1940 they were relocated and the 16th Anti-Aircraft Gun Unit replaced them using the camp as a base to practise firing at targets towed by aircraft over the sea. This arrangement continued until the end of hostilities when the camp returned to its original use as a Holiday Camp. Fortunately, the West Beach did not suffer too much from German bombardment however, one isolated incident is worth a mention. At noon on the 12th December 1944 a V2 Rocket, on route to London, lost its way and blew a large hole in the promenade on the east side of the cafe where the first beach hut is situated to today. The rocket moved a great deal of sand but luckily there were no injuries. 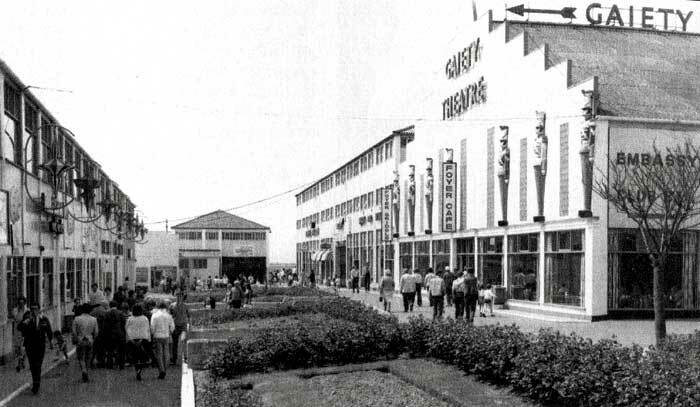 When Billy Butlin came to Clacton in 1936 he bought the area of land just west of the cafe which was then known as the West Clacton Estate. This consisted of the Jetty, five cafes, two boating lakes, four miniature golf courses, a mile of the seafront and three car parks - quite a large slice of the West Beach! He began building straight away, the amusement park was opened a year later and a year after that the camp was ready to accommodate a 1000 holidaymakers for the 1938 season. Due to the outbreak of war after just one year, the function of the camp was changed when it was taken over by the defence authorities to be used as a prison for the internment of aliens living in Britain. The re-opening of the camp and amusements after the war provided a much needed economic boost for the town. Onlookers enjoy watching the diving competition. Facilities were very impressive and all the events well organised. You would be awakened quite early then down to the dining hall for a hearty breakfast followed by participation in the physical jerks outside. After the six years of hardship, holidaymakers were keen to enjoy themselves once again. Billy Butlin ran his camps on strictly military lines; Radio Butlin would wake you at 7.45am for breakfast, after which it was outside to participate in the physical jerks session for your health and wellbeing! 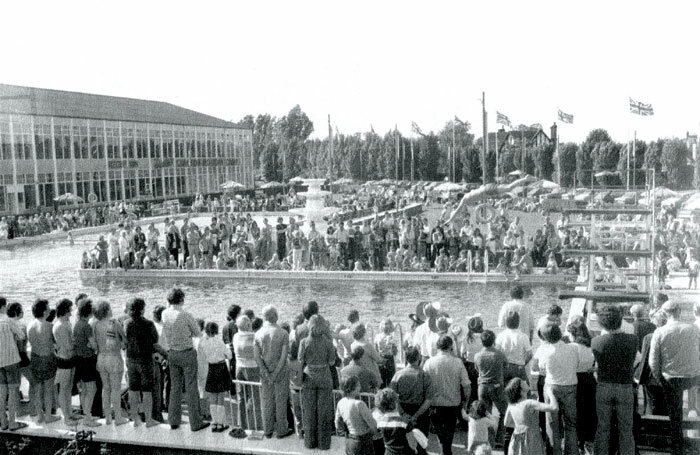 Throughout the day there was no let-up, the radio would continually encourage you to enter into the games, competitions and attractions on the site. A different approach to modern vacation requirements and after so much army discipline it is surprising this format worked so well - but it did and by 1970 the camp had grown to accommodate up to 6000 guests. It may have been a change in the general public's holiday requirements or perhaps the introduction of cheap, packaged holidays to a destination where the sun was bound to shine, but by the early eighties the writing was on the wall. Having played such a major role, the closure in 1983 dealt a severe blow to the town; it was sold to a company named Atlas Park but only remained open for another year. The camp, which had provided holidaymakers with enjoyment for almost 40 years, had outlived its attraction so was finally pulled down to make way for a residential housing estate called Martello Bay. Main Street showing the Gaiety Theatre on the right, a venue which attracted many famous stars to perform over the years. The photograph was taken in 1970. From the photo below we know the cafe stands on the site of the old coastguard boathouse. However we are still trying to find out exactly when it was first built, but we can say the local community and holidaymakers have been enjoying refreshments here for many years! Viewed from the Jetty around 1924, the rebuilt boathouse and slipway appear to be in good working order. The houses in the background have all been replaced except for the one on the extreme left. 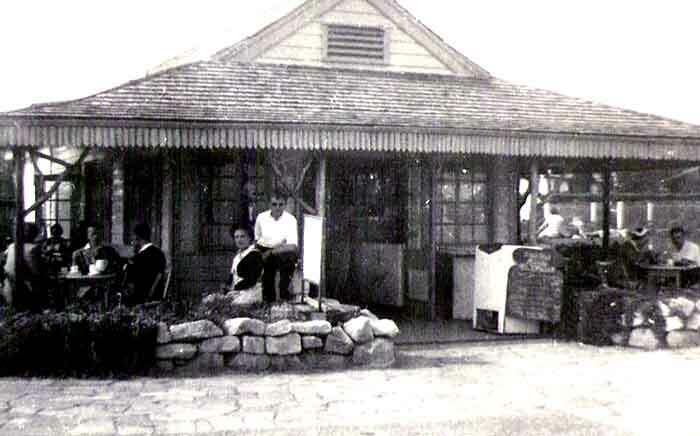 This wooden cafe shown in 1956 was subsequently replaced with a brick and tile structure which was burnt to the ground in 1990. The present rebuild has increased seating and a larger kitchen. 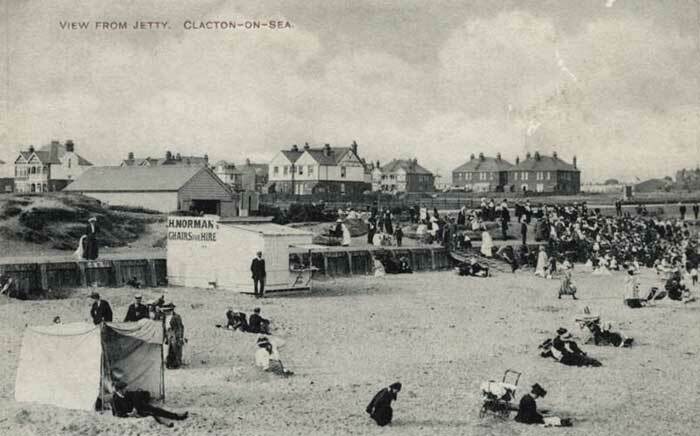 We would like to thank all the cafe customers who helped us research the history of Clacton-on-Sea and very kindly gave permission for copies of their photographs to used on the website.